SugarBush Golf Club in Davison Michigan has been awarded 4 stars by Golf Digest Places to Play - and is very deserving of the rating. This is a long hitter's paradise, and is also one of the most beautiful courses in the tri-county area. The four sets of tees measure from 7285 to 5034 yards. The Gold tees play to 6914 and the Silver's to 6502. The 6500 yards listed on the score card was intimidating at first glance, as I have lost more than several yards off the tee since turning middle age, and generally look for the tee box measuring between 6000 and 6300. Of course, the front tees were out of the question...To my surprise, the layout allowed me to shoot near my 14 handicap, and I had an incredibly wonderful time doing it! 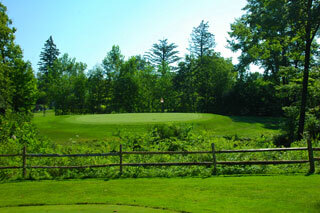 SugarBush is a quality course, that demands your concentration throughout the entire round. There are a few easy ones, but you will generally be tested for accuracy and distance somewhere along the line and will earn your par on every hole. The front nine is very forgiving off the tee, with many wide open fairways allowing some room for error. There are no overly long holes, and certainly no short ones. From the Silver tees there are 4 par fours measuring between 386 and 400 yards, with another at 352. The par threes are reasonable at 163-191, and the two par fives measure 469 and 490. The length is fairly spread out here. The back nine plays just a tad longer, and is infinitely tighter. You will be astounded by the views on nearly every hole, and your accuracy on the approaches will be severely tested. There are 5 par fours on the back that measure over 398 yards from the Silver tees! Make use of their grass range before teeing off. A short game area with practice bunker is also on property. The practice green is indicative of the quality and speed you will find on the course, though it is a bit more undulating than what you will encounter on your round. 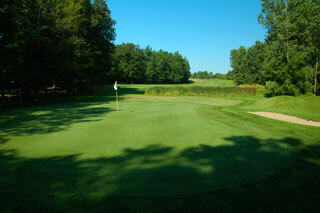 The greens at SugarBush were in excellent shape, putting quick and true. 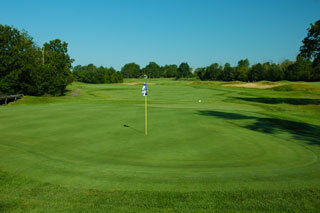 In fact, the entire course was in good shape, from tee to green. An appreciated feature was the 100/150/200 markings on the cart path. After a heavy rain, play was cart path only. We wish more courses would provide this amenity to golfers, so we don't have to waste time walking the fairways looking for yardage markers, while carrying half the clubs in our bag out to the ball. Sprinker heads are also marked here, and pin placements are indicated by color-coded flags on the greens. A yardage/hole diagram booklet is also standard on each cart. The opening hole is a long par four, but is wide open all the way to the green - indicative of many of the holes on the front nine. Aim over the mounds on the left side of the fairway off the tee on number two. There is a hidden pond on the right side near the 150 marker, which will catch anything hit to that side. Remember this ! You will need a long drive on the short par three 3rd, then another long carry over a marsh on your second shot. The approach narrows considerably. 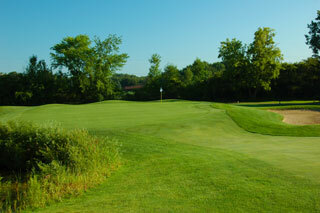 An undulating green provides the challenge on the long par 3 fourth (191-210 yards), which is fairly open. There is also lots of room off the tee on the long par four 5th, which also narrows on the approach. The next four holes present good scoring opportunities. The sixth is the shortest par 4 of the layout (352), though it does play a bit uphill. A mid-range par three on number seven is followed by a reasonable par five, with lots of room for error on the first two shots. The closing hole on the front is very wide open off the tee, with lots of room left. It turns slightly to the right, encouraging long hitters to bend one in that direction. 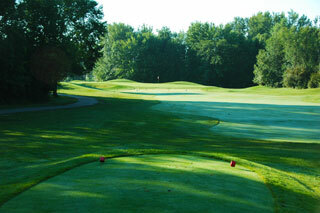 The backside presents one of the most beautiful and challenging nine-hole layouts in Michigan. 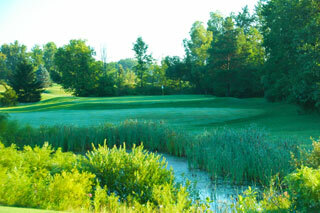 Carries over water and marsh, and tight tree lined fairways and greens are the norm here. There are relatively few bunkers, but enough trouble lurks, making sand traps unnecessary. The tenth is a dogleg right with a short carry over marsh off the tee. 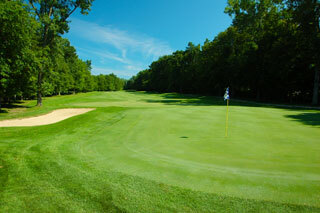 The green slopes right to left and is flanked by trees on both sides. Eleven is long and straight, and narrows on the approach. These are two very score-able holes. The 12th is a test. It is narrow off the tee, with a pond in the fairway 150 out. Trees also surround the green here. There is room off the tee on the long par five 13th. It narrows for the second shot, and the approach plays uphill with a drainage ditch crossing the fairway 30 yards out. The green is framed by mounds with tall grasses. The par three 14th plays uphill and demands one extra club to reach. There is a marsh left and a narrow fairway that snakes toward the right on 15. This is a beautiful hole that will demand your best golf. The par three 16th is a postcard hole - with a postage stamp green. You need to airmail this one with a high, soft shot. Anything short will find the creek, and if you fly the green your ball will be out of bounds, past the fence that borders the property. A narrow fairway greets you on the 17th. This is a dogleg left that really cannot be cut. There is room right on the second shot, and a fair approach to the well conditioned putting surface. On the finishing par five, there is more room off the tee than it seems. On your second shot, you will have to be careful. The closest you will want to approach the marsh is 150 yards out if you play it to the right, and 200 if you go left. This is a true 3 shot hole. The approach is one of the most intimidating aanywhere. SugarBush is not for the faint at heart. It will challenge golfers of all abilities. Play it safe if you are unsure of your ability to carry the hazards on some of the longer holes. Accurate approaches will often lend you the opportunity to save par, as the green complexes, though beautiful, are very playable. Hit it well and you often will be rewarded with a good lie, and good putting opportunity. The fairways and greens are finely sculpted, and the rough here is playable. The doglegs are not severe - you can see what you are getting into off the tee on nearly all the holes. This course is visually pleasing - and is a top golf value in Michigan. Rates of $39 weekdays and $49 weekends include cart. 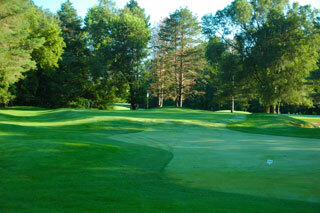 In reviewing courses, we play a lot of golf - and found SugarBush to be comparatively impressive. Bring your camera and your "A" game. Click here for more information on this golf club.